While gardeners across the Midwest call on the goddess of grain to slow down the zucchini, I’m still looking for one. My zucchini plants continue to flourish as they choke the adjacent collards and carrots. Yet each morning as I part their prickly, broad leaves searching for fruit, so far I’ve found only two small squash. Nearby the cucumbers won’t stop. Even though I carefully lift their scratchy foliage and survey the vines, cucumbers still have a way of hiding. The next day I’m apt to find them overgrown, but unwilling to let them waste, I’ll make soup. Cucumbers seem to grow well on the edge of oasis-like areas in dry climates. I’m always amazed to find so many cucumber preparations stemming from cuisines in the Levant and north Africa. At one point in my life when living in a dry, highland, near-tropical region, cucumbers were the only fresh vegetable we could buy for weeks on end. The amazing, refreshing cucumber makes one of the best and quickest summer soups you’ll find or taste anywhere. All you need is a blender, some fresh herbs, a pint of good plain yogurt and you’re in business. 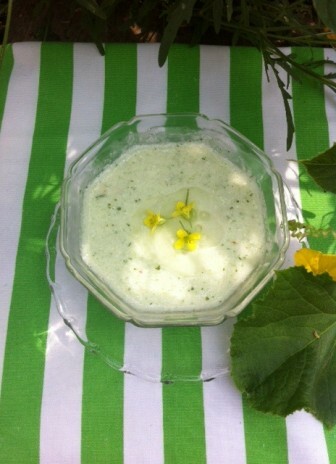 Turn those overgrown cucumbers into a chilled soup to refresh your spirits as the dog days of summer wind to a close. Peel cucumbers, slice lengthwise and scoop out seeds with teaspoon. Place seeds along with 1/2 cup water in blender; whiz to fine puree; press through sieve, discard seeds and use this cucumber water in soup. You should have at least 1 cup. If using seedless or English cucumbers, omit this step, and add 3/4-1 cup of cold water to diced cucumbers. Cut cucumber halves into strips, then large dice (measure a generous quart). In mixing bowl combine cucumber, crushed garlic (use tip of your knife on wooden board to crush garlic and salt), chili, and onion and herbs. Puree mixture in blender in batches, adding cucumber water. Leave last 2 cups of cucumber mixture in blender. Add yogurt plus optional cream and pulse once on and off to mix. Combine pureed mixtures. Rinse out blender jar with 2 tablespoons water and add to soup. Season with white wine vinegar, lemon juice, cumin, olive oil salt and pepper. Chill and serve with herbs or arugula flowers. Makes 6–7 cups. You are currently browsing the Mary Jo's Kitchen blog archives for August, 2013.